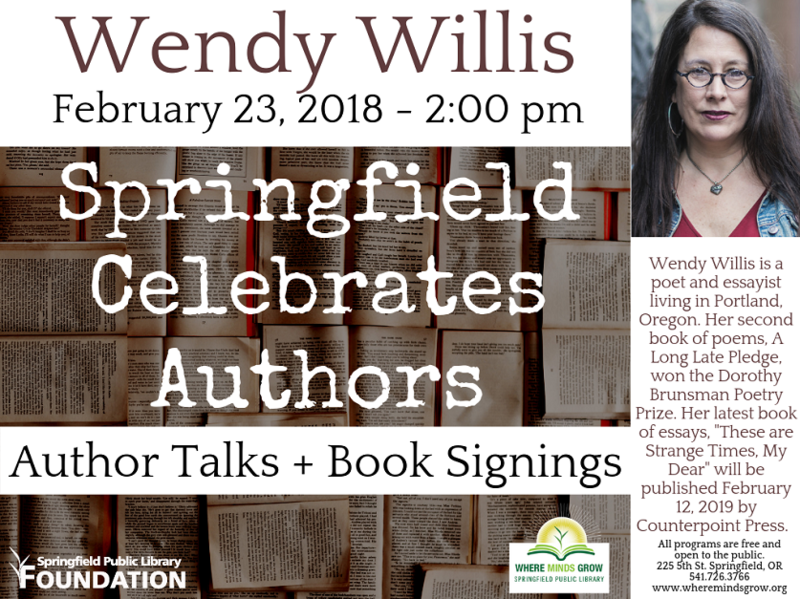 Many people would agree that we are living in interesting times and on Saturday, February 23 at 2pm, you can hear from award winning poet, essayist and former Springfield resident Wendy Willis as she reads from her latest book of essays on modern life: “These Are Strange Times, My Dear: Field Notes From The Republic”. These essays explore modern topics such as personal resistance, civic loneliness, the exploitation of personal data, the ongoing opioid crisis and more. Winner of the Dorothy Brunsman Poetry Prize, Willis, who now lives in Portland, has previously published two books of poetry and in journals including New England Review, Oregon Humanities, Poetry Northwest, The Rumpus, Zócalo Public Square, and ZYZZYVA. Willis is a lawyer, the executive director of the Deliberative Democracy Consortium, and the founder and director of Oregon’s Kitchen Table. Books will be available for purchase from Smith Family Bookstore. Springfield Celebrates Authors is an annual series presented by the Springfield Public Library highlighting local, national and international authors. Over the course of five months patrons can hear from published trail guides, essayists, poets, Young Adult Authors and Sports Journalists. The next Springfield Celebrates Authors event will feature Will Ritter, author of the “Jackaby ‘ and ‘Oddmire’ series on Saturday, March 2 at 2 p.m.